Today, I joined my friend Don Riepe as a co-leader for an Early Spring Migrants walk, which was scheduled from 10:00 to 12:00 am at the Jamaica Bay wildlife Refuge. The turnout was rather well considering the rain that had fallen earlier in the morning and we had over 40 people in attendance. Don began the walk by talking for a bit about the refuge and then we began our walk along the West Pond trail. The day felt and sounded like a true spring day, with the sounds of Red Winged Black birds, Carolina Wrens and House Finches permeating all along the trail. The group was very alert and before long were pointing out birds and asking questions. 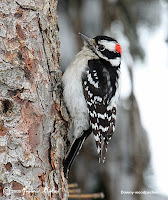 As Don and I spotted different birds we pointed them out to the group and since I had my scope with me I was able to put several birds in the view, allowing many folks to get good close up looks at many birds. Our first highlight of the day was a Great Egret that was observed in the marsh; many in the group got good looks and were treated to the bird in flight. Our next neat find were a pair of Ospreys on the nesting platform. 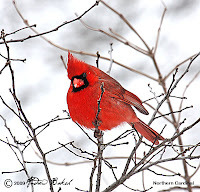 We had looks at both male and female and for some it was a life bird. As we continued on the trail, Don pointed out the various nest boxes and their uses as well as the plants that play a critical role in sustaining our feathered friends. Bench one, gave us our first look out on the West Pond and we had nice looks at Ruddy Ducks, Red-breasted Mergansers and Greater Scaup. While looking at some Buffleheads, a couple of Tree Swallows flew in doing what appeared to be a courtship dance in midair. As we continued along the trail, we observed a decent number of Snow Geese, a couple of Mute Swans and an American Coot. We had stopped along the trail when the second highlight of the day was spotted in the form of a Canvasback Duck, which I happened upon while scanning a raft of Ruddy ducks interspersed with Greater Scaup. I asked Don for a second opinion and he confirmed the find. As far as I know, we did not have a recorded sighting of a Canvasback at the refuge all winter, so this was an exciting find. For many in the group, this was a life bird. After many in the group had good looks, we continued on and along the way picked up several birds including a Great Blue Heron, Glossy Ibis in flight and Oyster Catchers out on the edge of the marsh in pumpkin channel. We continued on and made the loop back to the visitor’s center where Don spotted the third highlight day in a Merlin. We broke for a few minutes and then it was onto the East Pond. On our way to the East Pond, Don as alert as ever spotted our first Garter snake, which slithered away into the brush before anyone could get a photograph. Our second garter snake was spotted sometime later and that made it two for the day. While no Spring peeper was spotted, we could hear them all around us…a pleasant sound that coincides with the arrival of spring. Out on the East Pond, most of the species were the same that we had noted earlier with the exception of a few including American Wigeon and a Great Cormorant. We wrapped up the walk around 1:00 pm; it was way over the time for the event, but we were all having such a good time that no one paid any attention to the clock. The consensus among the group was that the event was excellent and many wanted to know when the next walk was. Don’s easy going personality, his knowledge of Jamaica Bay and the way he engages his audience on the ecology and diversity of wildlife in Jamaica Bay is one of the many reasons why these events enjoy a huge following. We saw 41 birds, heard one (Carolina Wren) for a total of 42; the highlights included the Ospreys, a Canvasback Duck, a Merlin and a Barn Owl. We also saw two Garter Snakes and heard many Spring Peepers. 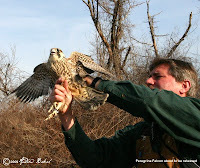 A Peregrine Falcon release, that was rescheduled from yesterday due to the weather went off today without a hitch early this morning at the Jamaica Bay Wildlife Refuge in Queens NY. 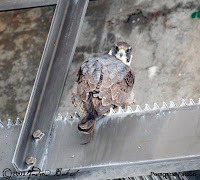 The bird was a rehabbed immature male Peregrine, which showed off a nice browner color than an adult. After ringing the bird, Chris our banding expert, along with a few of us walked out onto the West Pond Trail and completed the release. The immature Peregrine took flight with no problem and with its new found freedom, gained altitude nicely and looked strong in flight…everyone was pleased and satisfied with the way the release went. 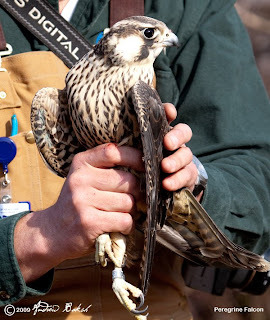 Like all falcons, the Peregrine Falcon has feet that are highly adapted to grasping their prey with the very long toes. They also have short beaks and jaw muscles modified to deliver powerful bites. 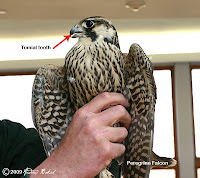 Along with powerful jaws, the Peregrine has a Tomial Tooth, known as the “killing tooth.” It is a notch on the cutting edge of the upper beak that is used to sever the prey’s spinal column. In one of the photos, I have pointed out the Tomial tooth. If we are lucky, this Falcon will survive, find a mate and raise a family. So, if you visit JBWR keep your eyes peeled for an immature Peregrine Falcon with a band. With the last Barn Owl nest box to setup, Don, Doris, Fred and I met up around 3:00 pm and headed out to the location we had decided upon. The materials were where had left them, so all we took were the equipment needed for the install. 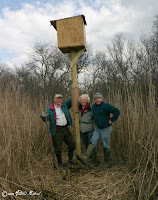 Once arriving at the location, we assembled the box, then dug the hole for the post and placed the nest box in its home. After a few minor adjustments, we added a couple of braces and shored up the base. We had one slight hiccup...in our haste to get the job done, we overlooked latching the side door and Fred and I had to give Don a lift to get the hook in place. After the work was done, I headed to Jamaica Bay wildlife refuge visitor's center, for a scheduled Woodcock walk that was being led by Rangers Julia and Kayleigh (sp). Ranger Julia asked if I would like to volunteer in co-leading with her and Kayleigh on the walk and I obliged. The walk was scheduled for 7:10 - 9:00 and attracted 40 attendees...a large group for a bird walk. Ranger Julia, began the event by giving a talk on Woodcocks and explained some of the etiquette that was required for the walk such as no talking, cell phones being turned off etc. During the presentation, one of the attendees pulled a surprise on the group by producing a “dead” woodcock that she had kept in relatively good shape and had brought in to display. The entire group all had good looks and for many it was their first time seeing one albeit, it was not alive. Once Julia got through her talk, we headed outside which was around 7:20 pm and immediately heard the “Peent” call that is associated with this bird. Further into the walk, we could hear the calls all around us. It was obvious we were going to do better this year; we first saw the silhouette of one Woodcock and then I got two of them in Don’s spotlight that I had taken with me. After about an hour, we called it a night and headed back into the refuge. The consensus among attendees, was that the walk was a success. Initially, I had my doubts on the size of the group being able to maintain silence during the walk; however, it was apparent that Julia was able to convey the importance of being quiet and that along with a bit of luck was critical to the night's success. The Woodcock, while in the same family as shorebirds is considered a forest bird and spends the day in the woods where its cryptic coloring blends into the leaf litter. On spring evenings, like the one we went out on, the Woodcock comes out into the open to do the spectacular sky dance (note, only the male does this dance). It takes a lot of patience and plenty of luck to see Woodcocks and we had enough of both as we were able to see a few of them. Today, I went out into the Jamaica Bay Marsh, with Don, Eva, Barbara and Denis to install and repair Osprey Nesting sites. Our first stop was at JoCo Marsh; once there, we offloaded the necessary equipment. The platform that we had dropped off at the site on the 16th was still there and so we moved it closer to the nest site in preparation for our work. The objective at this site was to cut the platform post to a length that was more manageable and so Denis got to work on shaving off the required length. A few slices of the chain saw and the post was cut to size. We then positioned the platform on the post and nailed/screwed everything in place. A couple of braces were added to further shore up the nest and Don added a Swallow nest box right below the platform. We briefly did a quality review and then it was back to unloading back our equipment and on to our next site. On the way to our next stop, we came across Oyster Catchers and Great Cormorants that gave us great views for photographs and those of us who had our camera gear in tow took as many photos as we could. At the next site, we examined the platform from our bins and determined that the nest was fine and so we moved on to a third site. At this location, the looks from the bins suggested that repair work was necessary and so we docked and offloaded our equipment and went through the cycle of doing an analysis of the nest site. We found that the nest only needed shoring up and so Denis went up the ladder and did some repair work. By then the high tide window was shrinking and so we wrapped up and headed back to shore. It was a good afternoon’s work, which left us with only one Osprey platform to install and one Barn Owl Box, which Don and I hope to setup tomorrow. On Sunday in overcast conditions, Don, Doris and I went out in the boat into Jamaica Bay. Our objective was to put up a Barn Owl nest box and to visit a few of the Osprey platforms in the bay, to do repair work. Our first stop was at the Barn Owl Nest site; once we arrived at the location, we offloaded the nest box, post, materials and tools and began taking the items ashore. 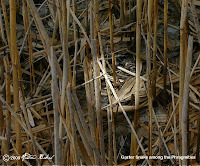 Don, found and settled on a location after first, contemplating how close this new box was to other nest sites. While Doris began digging, Don and I returned to our landing site to pick up the nest box. Together, we lugged the nest box back to where Doris was digging and began the assembly. After the box was assembled and the hole ready, we maneuvered the bottom end of the post into the hole and then lifted the top end with the box until we had the unit standing upright. We made adjustments to make it as straight as we could, then filled the hole and shored up the bottom by bracing it with some planks. There was no time to admire our work, as we were working in the high tide window and so it was off to check out the Osprey platforms. Heading back out we noticed several mounds that Don attested to being “Rats” nest…no wonder the Owls like the location for nesting. Our next stop was Silver Hole Marsh; once we arrived at that location, we again unloaded our materials and tools and headed out to the platform. Once we got there, we checked the platform post and saw that it was in excellent condition and remained pretty solid in the ground. The platform was another story and Don, once he went up to the platform, found that it required some repair work and so he set about adding some braces to shore up the edges. We finished up the work at that location in good time and escaped unscathed despite falling debris; we concluded that safety glasses and hard hats may be good to have on hand the next time we go out there. On our way out of the channel, we had a bit of an adventure as we got careless and ran aground while trying to get close photos of Oyster catchers that have started to return to the bay. Doris and I got out into the water and together we combined rocking the boat with Don revving the engine in reverse and we were able to get out of the minor jam. Of course, that was the end of trying to photograph the Oyster catchers in that specific location. Our last stop was Joco Marsh and there we assessed the platform and decided that we needed to replace it. Unfortunately, we were running out of time as the tide had started to recede and so we offloaded the new platform and planned on returning sometime during the week to finish up the job. On the way back, we summed up the day’s work as successful…though wishing we could have done more. I had a great time working with my friends in providing nesting sites for the birds that I love and at the same time I picked up two “first of the season” in the Oyster Catcher and a Peregrine Falcon that was spotted under the Crossbay Bridge. My friend Don Riepe and I had talked earlier in the week about doing some work on the Osprey nesting platforms in Jamaica Bay before the arrivals of the Ospreys. 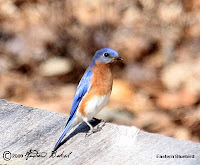 Since we wanted to do some work as well in the Bay, we decided on a start time of 12:00 pm, this gave me enough time to get some birding done and birding I did. 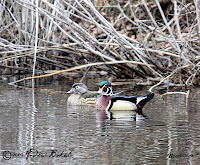 I birded the East pond for a few hours and in that time I saw Song Sparrows, White-throated Sparrows, Wood Ducks, Buffleheads, Greater and Lesser Scaups, Red-breasted Mergansers, Hooded Mergansers, Mallards, Gadwalls, American Wigeons, American Black Ducks, Redhead Ducks, Common Goldeneye, Greater Cormorant, Double Crested Cormorant, Ring-billed Gulls, Yellow-rumped Warblers, Mute Swans, Northern Shovelers and Ruddy Ducks. 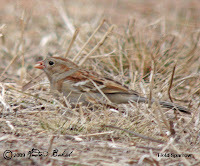 Back at the visitor’s center, I had a nice surprise of three field sparrows that were hanging out with Juncos in the newly mowed meadow. By then, it was time to get to work so I met up with Don and together we picked up all the materials needed for the nest repair. Once that was done, we drove onto the West Pond trail over near where the Osprey platform was out in the marsh. Switching to waders, we ventured into the marsh and got the ladder up to the nest platform. A review of the platform showed it to be in rather good shape and so we decided on only shoring up the platform edges. We worked for about an hour getting the repairs completed and also putting up a few Wren nest boxes along the trail. By that time we had expected the tide to be back in, but it wasn’t; we realized that we had run out of time as far as the light was concerned and so the work in the bay was put off for another day. Hopefully by next Thursday or Friday we could get some additional work done before the Osprey’s show up. Following an IBM science fair, the boys and I visited Teatown on Saturday and decided to hike the Lakeside trail, which was approximately 1.6 miles. Along the way we kept alert for signs of Pileated Woodpecker. While, we did see a number of fresh holes, we did not see or hear the Pileated. Nevertheless, we did see a few birds and signs and sounds of others, including a partially eaten fish near the shore, which seemed to indicate the possibility of an Eagle or Eagles fishing the lake. We had nice looks at Pine Siskins, Red-bellied Woodpeckers, Downy Woodpeckers, Turkey Vultures, Black Vultures, American Goldfinch and Eastern Bluebirds to name a few of the species seen. 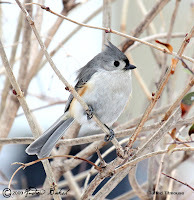 With the weather forecasting snow, I decided to plan on trying to get some photographs of the winter regulars in the backyard. The plan came to fruition with the exception of a few candidates either missing the photo shoot or not sticking around long enough to pose. 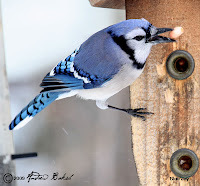 It was a cold day, but I hung out there and got some decent shots and enjoyed the time watching the birds hanging out at the feeders.